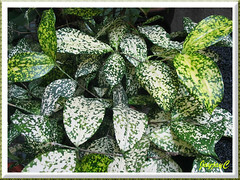 Stunning variegated foliage that sparkles among a crowd of greeneries. Dracaena surculosa is a much-loved ornamental foliage plant in our garden that really thrives on neglect, once established. Currently, we have the ‘Florida Beauty’ that is super slow-growing, just perfect as a potted plant as seen in the right image. Though a 7-year old plant, it is only about 90 cm tall and 76 cm wide. Simply fabulous for our small-sized garden where plants are mostly container-grown. We’ve yet to experience its flowering even once, though! As compared for the same period of time, the green variety, Dracaena surculosa ‘Punctulata’, a much more vigorous-growing shrub that blooms frequently too, would have reached probably 3.5 m in height. We no longer grow this since the late 90s but noticed that it was a haven for nesting birds like the white-browed yellow-vented bulbuls when we grew them then. Probably, this plant is favourable for nesting, with sturdier canes in abundance, darker foliage for camouflaging and raised on taller stems for protection against pouncing cats. Features: Dracaena surculosa, though a species of the genus Dracaena, is unlike most dracaenas that have long straplike leaves.It is smaller, more shrub-like in appearance with branching and spreading stems that are thin and wiry, including bamboo-like canes that are fairly erect and slender, growing from the crown and forming a thick clump as it ages over the years.An evergreen perennial that is slow-growing, very hardy and typically reaches a height ranging from 76-121 cm. 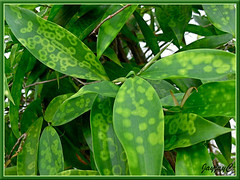 An exception is the vigorous-growing green-leaved cultivar, Dracaena surculosa ‘Punctulata’ that can reach 3.5 m or more under optimum growing conditions.Foliage of Spotted or Gold Dust Dracaena are beautifully variegated with white, creamy or yellow spots and blotches irregularly spread or marked with a white band along the midrib. Depending on the cultivars, these spots can be densely or sparingly seen on the dark green leaf blades. 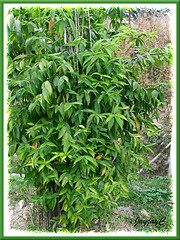 Mostly, the smooth and leathery leaves are oval or elliptical with mucronate tips, 7.6-12.7 cm long, simple and arranged in opposite pairs or in whorls of 3-4 along the wiry stems. Here again, ‘Punctulata’ differs in leaf shape, length and spots. Its leaf blades are slender, narrower and longer, up to 20.3 cm in length. Unlike the others, its background color is mostly medium to dark green and quite subtly spotted in yellowish-green or chartreuse and sometimes, none at all for some of its foliage. Dracaena surculosa also produces clusters of inconspicuous whitish flowers that are 7.6 cm long and sweetly scented in the late evenings. Flowers are followed by small and roundish berries in brilliant reddish-orange that contrast sharply with the foliage colour. Be aware that this plant is poisonous to cats and dogs. Culture (Care): Dracaena surculosa is a hardy plant that can be easily grown and need the least care. Light: Bright indirect light or filtered sunlight for best leaf colour and growth, but can tolerate lower light conditions. Insufficient lighting will result in greener leaves, dull variegation and weaker stems. A few hours of full sunlight is tolerable when acclimatized. Moisture: Medium water regularly, with soil kept evenly moist but not soggy. Overwatering or insufficient watering may cause leaf drop or yellowing. 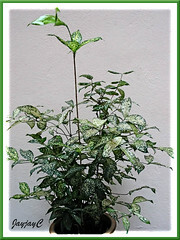 Occasional misting of its foliage is beneficial as it enjoys a humid environment. Soil: Any standard potting medium for houseplant with good drainage. Others: Remove discolored leaves to keep tidy. 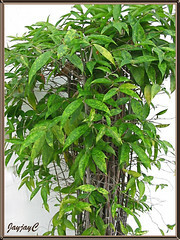 An occasional shower on their foliage to remove dust and a trim along old stems is recommended to rejuvenate growth. Or prune erect stems when there are one too many at various desired heights (new growth will readily emerge at cut levels) for a lovely aesthetic and ornamental display (this does well for the tall and green cultivar, ‘Punctulata’ from Sierra Leone). Feed monthly with a balanced houseplant fertilizer. Repot or replant when the clumps become overly potbound. Nonetheless, it likes to be potbound, so do not repot it in an over-sized one. Generally, disease and pest free. Propagation: Propagation from tip or stem cuttings that root easily in a glass of water or soil is by far the easiest method. Easily propagated by division of clumps too. Can be done by germination of seeds if available, though success rate is very low – read online that the pulpy ‘berries’ have to be completely dried to be viable. 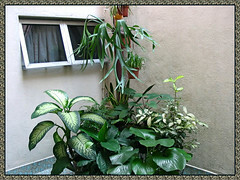 Usage: Dracaena surculosa makes an excellent ornamental plant, both indoors and outdoors. Very ideal as an attractive specimen in homes, offices, shopping malls, etc. as it is tolerant of low light conditions. Outdoors in the garden, it is suitable as a standalone shrub or mass-planted as a back of border or bedding plant in sunny or semi-shaded sites, or used in informal hedges and landscaping. Excellent too for container gardening, located at patio, deck, porch or courtyard as a specimen or with a crowd of other foliage plants. 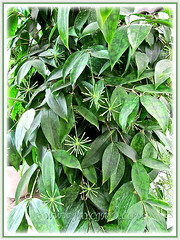 Its beautiful variegated foliage are popularly used as fillers to add interest, sparkle and beauty in floral arrangements. 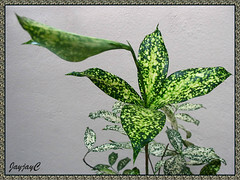 ‘Florida Beauty’ (Spotted Dracaena) – leaves are so spotted and blotched in creamy white or creamy yellow that its base color of deep green is much reduced. 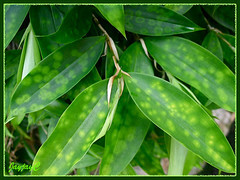 ‘Gold Dust’ (Gold Dust Dracaena/Plant) – dark green leaves, randomly speckled yellow that fade to white as the leaves mature; an image here. 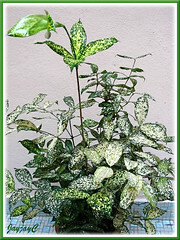 ‘Juanita’ – olive green leaves with a broad central band of creamy white and white-spotted margin; an image here. 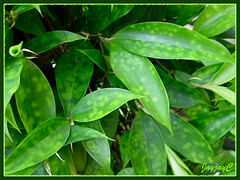 ‘Punctulata’ – medium to dark green leaves up to 20.3 cm long, dotted numerously with yellowish-green or chartreuse spots that fade to yellow or lemon as they age. Tall and vigorous-growing cultivar that puts out a lot of bamboo-like canes, is very sturdy and hardy, and accepts heavy pruning and neglect too. It is a common and favorite shrub with Malaysians, and commonly named ‘Buluh Jepun’ in the Malay language, which translates to Japanese Bamboo. Following up on a photo-use query I made via your “contact us” form. Please? Just responded…please check your email, Mr. Subjunctive. I want to buy Dracaena surculosa ‘Punctulata’ in and around London, but cannot find it anywhere. After reading this page I’m pretty sure my husband just bought one from the co-op. thanks for posting the dracena surculosa! I was wondering which dracena I had. I knew it was a dracena , just not what kind, ours lives on the window sill here in Philadelphia,PA. only 12″ tall , had it since 2005! You’re most welcome, Leslie! Great to know you’ve nailed your plant’s ID. I’m surprised to read that your 7-year-old plant is only 1 ft tall, like a bonsai plant, huh! Hello. I have a spotted plant, looks like the Florida Beauty. All of a sudden, the leaves began dropping. The dropped leaves feel heathy and the stems seem healthy. This is an indoor plant kept in indirect sunlight. Do you know what is wrong with it or what I’m doing wrong? Thanks. Hi Cindy! We’ve never kept it as an indoor plant. However from our gardening experiences, your indoor plant may need misting of its foliage regularly as it enjoys a humid environment or give it a shower now and then. Hope this helps! I stumbled upon your website while searching for a particular plant. I was wondering what its name. It was told by my uncle that it is a chinese bamboo but after 20+ years now I know Spotted Dracaena hahahaha! Cheers, Jeff! Delighted to know you’ve finally ID’ed your plant. My Florida Beauty is growing excellent despite being grown in my cold room. If your leaves have fallen it’s not humidity but a tempature fluctuation or draught. This is like on a hot humid day you get a storm and after the storm the tempature is quite cooler. Too much water and humidity the leaves will be soft and have soft soggy patches on them. Much thanks, Shannon Matthews for sharing your experience with this beauty. We truly appreciate you taking the trouble to impart valuable info. God bless. I want to know more about Dracaena surculosa and its availablity in kerala (India).Can you help me. Sorry, no clue about its availability in Kerala. I am interested in purchasing several of the Florida Beauty plants. Can you assist? Sorry, Maura Johnson… we’re unable to assist you. We have a project in science and we are about to use the stem of Dracaena Surculosa for good adsorbent of heavy metals. Do you know or atleast give ways how to dry the stem of it? Sorry Bea Jaug…. we’re clueless on this matter. Just wanted to know if its true that the stem of dracaena can really adsorb heavy metal? I didn’t read it in your content.. Sorry, we really don’t know whether the stem of dracaena can absorb heavy metal. Hence, it’s not mentioned in our post above. I’ve even google search for answers on this matter, but there’s no article on it.